Iranian President Hassan Rouhani, Azerbaijani President Ilham Aliyev, and Russian President Vladimir Putin at their economic summit, Baku, Aug. 8, 2016 (AP photo by Alexander Zemlianichenko). Geo-economics dominated the agenda of two critical meetings this week: a trilateral economic summit in Baku between Russia’s Vladimir Putin, Azerbaijan’s Ilham Aliyev and Iran’s Hassan Rouhani, followed by a bilateral summit in St. Petersburg between Putin and his Turkish counterpart, Recep Tayyip Erdogan. While matters of war and peace were also on the agenda—the stalemated conflict in Nagorno-Karabakh and the ongoing fighting in Syria—both summits’ main focus was on ensuring connectivity to the global economy. Let’s start with Iran. In the year since Iran acceded to the terms of the nuclear agreement it signed with the group of world powers known as the P5+1, Hassan Rouhani’s government has followed one overarching geo-economic strategic goal: to prevent Iran from ever again being easily cut off from the global economy. In the decades following the Islamic Revolution in 1979, subsequent Iranian governments always assumed that despite the hostility of the United States, Iran’s position as a major supplier of energy to the world would always put limits on the types of sanctions Washington could get other countries to agree to impose—and enforce—against Tehran. Through the mid-2000s, even close U.S. allies in Europe, as well as other key partners in Asia like Japan and South Korea, were never prepared to completely sever all economic contact with Iran. Its reserves of oil and gas were presumed to be a significant check on America’s ability to wield sanctions as a weapon. Slowly but surely, however, the Clinton, Bush and Obama administrations found ways to negate this Iranian advantage. Greater sanctions on Iran became more palatable if alternate energy sources could be found. Southern European countries like Italy and Greece, which had previously relied on Iranian crude, found Russian firms more than happy to step in as replacement producers. Fracking technology opened up vast new reserves of previously inaccessible North American oil and gas. The U.S. also became more savvy in how it applied pressure to other countries to stop buying Iranian supplies—dropping previous demands for other nations, like India, to go cold turkey in favor of a series of gradual reductions over time. Finally, new sets of sanctions on Iran’s energy industry made it more difficult for Tehran to keep up productivity or exploit new sources. After 2008, there was a steady decline in Iranian oil production, with sharp falls by 2014, as international pressure tightened—all without significant economic dislocation for Iran’s customers, which were able to find replacement supplies. Iran plans to make itself such a valuable keystone in the flows of goods and resources around the world that future attempts to isolate it would be too costly, economically and politically. Since sanctions were lifted as part of the nuclear deal, Iran has worked over the past several months to return its energy production to what it was before 2012, but in a market with a supply glut and low prices. Iran simply does not have the clout as an energy producer to make itself an indispensable part of the global economy. Instead, it has turned to connectivity. Iran must make itself such a valuable keystone in the flows of goods and resources around the world that future attempts to isolate it would be too costly, economically and politically. That explains the priority Tehran has placed on the so-called north-south corridor, using its ports along the Persian Gulf and the Indian Ocean, notably Bandar Abbas and Chabahar, as well as massive new infrastructure developments—railways, highways, canals and other lines of transportation—to connect South and East Asia with Eurasia and Europe. The corridor would cut the travel time for everything from Asian consumer goods to Central Eurasia’s natural resources to advanced European exports. For two of Eurasia’s major energy producers, Russia and Azerbaijan, which face their own issues of market access to the growing economic dynamo of the Indian Ocean basin, Iran offers the easiest and cheapest way to transit oil and gas. 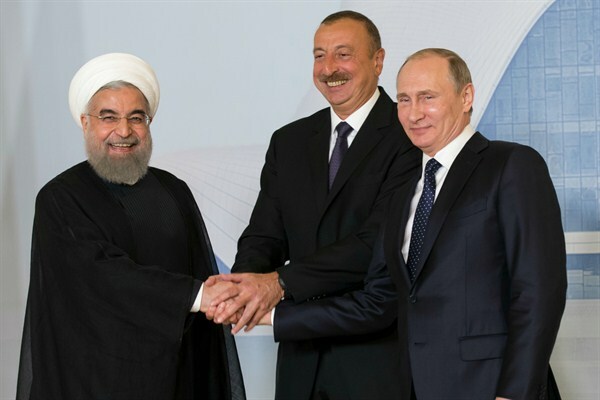 In Baku, Putin, Aliyev and Rouhani pledged to move quickly to connect their transportation routes and continue integration of their power grids. Following on the visit of Indian Prime Minsiter Narendra Modi to Iran earlier this year, in which India also committed itself to a massive investment in developing the north-south corridor, Iran is poised to emerge in a few years as a key cog in global trade, with major strategic benefits. If its geopolitical behavior became more troubling in the future, it would be harder for Washington to push for new sanctions against a globally integrated Iran. Other countries would also have much more of an incentive in promoting stability in Tehran for fear of jeopardizing these trade links. For his part, Erdogan’s pilgrimage to St. Petersburg on Tuesday and his willingness to offer apologies for the downing of a Russian jet in Syria last November reflect his assessment that Turkey’s future—and the durability of his own government—also depend on making Turkey the indispensable transit state for Europe’s energy supplies. The risk of heightened conflict with Russia not only suspended plans to develop the new Turkish Stream pipeline, which would carry gas from Russia to Europe via Turkey, but also raised questions about the security of the trans-Anatolian pipeline set to bring gas from Azerbaijan to European markets. At the same time, on the heels of Turkey’s failed coup, the growing sentiment in Western capitals that Ankara is a more unreliable partner, and that Erdogan himself is part of the problem, means that he needs to find new reasons to sustain Western support and interest. Erdogan’s dream is to have multiple energy suppliers use Turkey as their hub. Azerbaijan is already committed, and Erdogan will likely make the case to Iran to consider using Turkey as a way to send some of its gas westward. He has sold Russia on the Turkish Stream pipeline, which would allow Moscow to proceed with its plans to cut out Ukraine as an energy transit state by 2019. Turkey is now trying to convince Israel that its interests are best served by sending its offshore natural gas to Turkey and then onward to Europe. If all these plans are realized by the end of the decade, it would become much more problematic to sanction Turkey for any of its internal or foreign policy behavior. Russia, meanwhile, wants to guarantee that it will always have friendly export routes for its energy, while ending its dependence on Ukraine as the middleman for its European clients. In turn, the European Commission and some European Union states like Poland realize that projects like Turkish Stream or the second Nord Stream pipeline, directly connecting Russia and Germany, would remove some of the checks on Russia that come with transiting energy through Ukraine and some Central European states. The crisis in Ukraine and Western sanctions against Russia over its annexation of Crimea have demonstrated that Russia still remains vulnerable to the geographic constraints on its export routes. Finally, Azerbaijan has no desire to ever be in the position that its neighbor across the Caspian, Turkmenistan, has found itself in the past, with its economic future resting on only one export route for its energy supplies. Baku’s ability to export gas westward to Turkey needs to be balanced by good relations with Russia, to always have access to Russian export lines. With sanctions on Iran lifted, Azerbaijan sees another opening, with the opportunity to develop an additional southern access corridor to the Persian Gulf. The plans discussed in Baku and St. Petersburg are ambitious. If executed, Russia, Iran, Turkey and Azerbaijan will all be in a much stronger position to prevent anyone else, including the United States, from using the tools of economic statecraft against them. Nikolas K. Gvosdev is the Jerome E. Levy Chair for Economic Geography and National Security at the U.S. Naval War College. The opinions expressed here are his own.